The kids and I ventured to the Farmers Market this morning and grabbed all sorts of produce. We did learn that we don’t need to eat breakfast before going. All of the different produce stands offer samples of fruit, popcorn, juice, etc. We had a feast while walking around! I bought 5 lbs of the prettiest apples I have seen all year! I commented on the A Few Short Cuts Facebook page for suggestions and Jamie answered with the cutest idea! 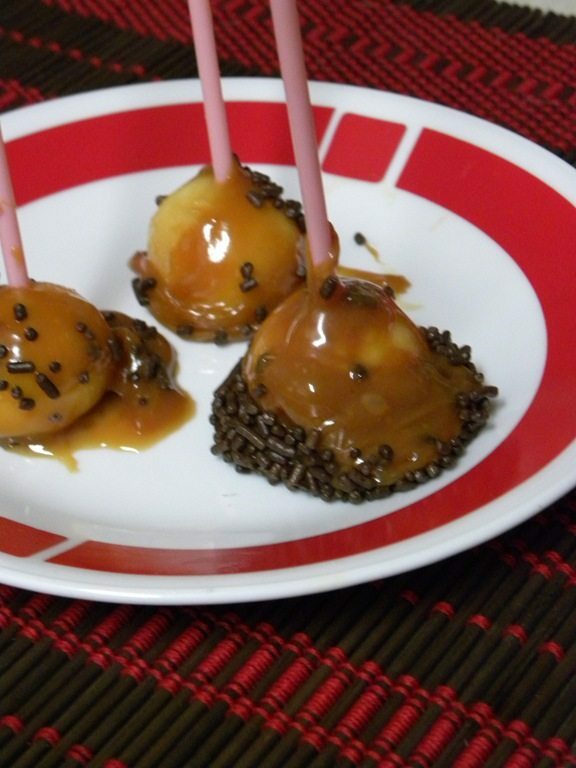 Mini Caramel Apples from Family Fun Magazine! I don’t know how I missed this one! These are so cute and perfect size for kids. I don’t want my kids eating a whole caramel apple before bed. First, cut the lollipop sticks in half at an angle (the pointy end will go into the apple pieces easier). 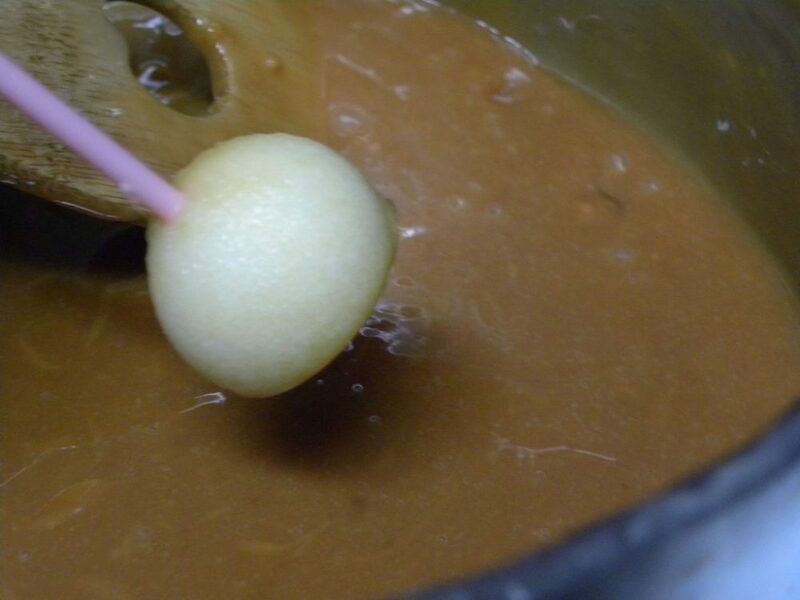 With the melon baller, scoop little balls out of the apple. 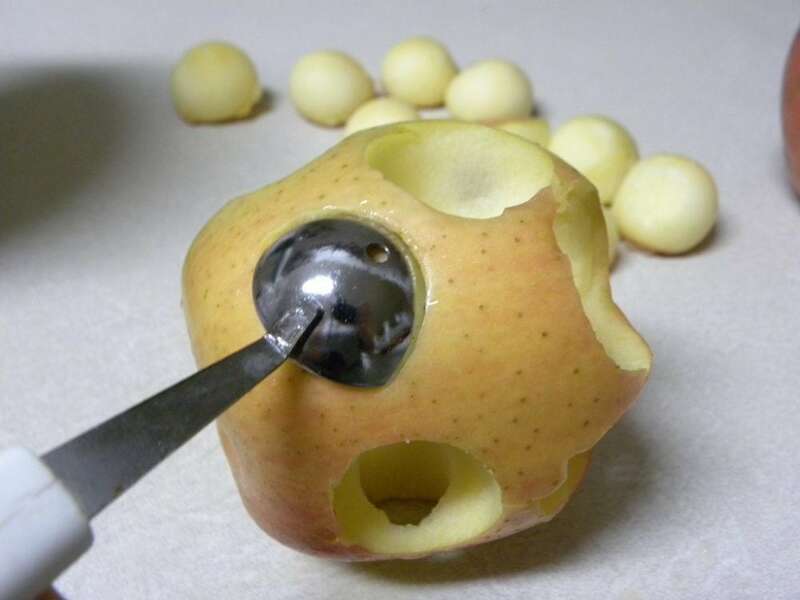 Each ball should have a section of apple peel. Push half of a lollipop stick into the peel of each ball. Pat the apple pieces dry. Melt the chips according to the package directions. Dip and swirl the mini apples in the melted chips, then roll the apples in nuts, sprinkles, nonpareils, or coconut, if desired. Place the mini apples in paper candy cups to set. Looking for a different dessert? Try one of these! These look amazing!! I can’t wait to try them out!! I have been looking into ways to make these with caramel and one suggestion that I came upon (but have not tried yet) was to dip them in the chocolate first, then in the caramel which will stick to the chocolate but not the peeled apple. 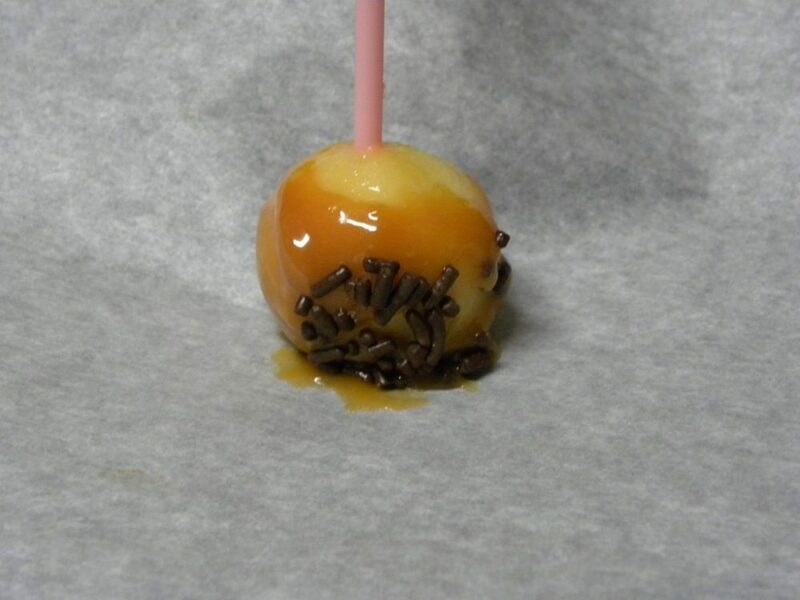 Apparently it is the water from the apples that causes the caramel to slide, so if you can “seal” that in first, then theoretically the caramel should stick. I am trying to use up my caramel I bought on BOGO a few weeks back at Publix so I am going to give it a try. These look awesome! Can’t wait to try them with the kids!